Utter luxury. Our Business Premier™ cabin is packed with features that make it a cut above. 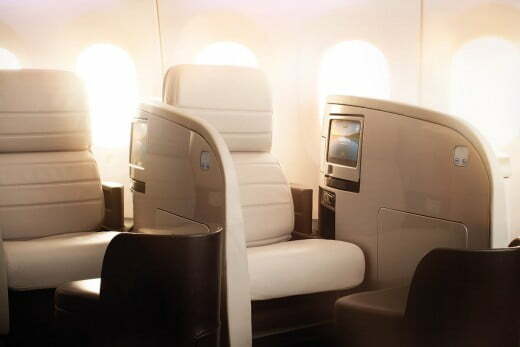 Business Premier is available on all Boeing 777-200, 777-300 and 787-9 long haul services operated by Air New Zealand. In Business Premier, you'll enjoy a super soft leather seat that transforms into a luxurious lie-flat bed, with a memory foam mattress, two full-size pillows and a cosy duvet. There's also an ottoman footrest that doubles as guest seating. And all lie-flat beds have direct aisle access. Relax in comfort with Business Premier and enjoy one of the longest lie-flat beds in the sky. The 777-200 and 777-300 feature a luxurious leather armchair at 22" (55.9cm) wide that converts into a 6'7.5" (2m) bed. For supreme sleep, try the Dreamliner's customised chalk-coloured leather lie-flat bed, complete with an indulgent memory foam mattress, duvets and pillows. In our Business Premier cabins you'll be treated to an unforgettable culinary experience. Our world renowned Kiwi chef has developed a mouthwatering menu full of fresh and innovative creations - from hotcakes for breakfast to char-siu duck for dinner. And, of course, there's an extensive selection of premium New Zealand wines to complement all meals. Still hungry? Don't worry, you can order up a range of snacks throughout the flight directly from your entertainment screen. See a sample Business Premier™ menu or learn more about our cuisine and wine. Take control with on-demand entertainment and enjoy a wide range of audio and video including the most recent blockbuster movies, TV programmes, exclusive audio programmes, and a CD collection of the very best in music. You'll enjoy your own individual screen and your entertainment experience will be enhanced with Active noise cancellation headsets to ensure crystal clear sound. If the kids are coming too, there's a dedicated section with content specifically selected to entertain a younger audience. As a Business Premier customer, you'll enjoy exclusive services such as premium check-in, courtesy lounge entry and priority baggage. On board you'll also receive personalised inflight service, an amenity kit with deluxe toiletries, and complimentary bottled water. We're here to ensure an exceptional journey. *The 360° panorama is of our 787-9 service. Please note when on board the 777-300 and 777-200 long haul services your experience may be different to what is shown in this panorama. ^ Eligible for Airpoints Dollars except when purchased with Airpoints Dollars or grabaseat Greenlight fares. Eligible for Status Points except when purchased with Airpoints Dollars.